The market could be throwing the baby out with the bathwater. What: Westmoreland Coal Company's (NASDAQ:WLB) stock fell 20% in July. Investor sentiment has been shaken by the bankruptcies of major U.S. coal miners and it's taken a bite out of the stock prices of all coal producers. In fact, one of the country's largest coal miners was rumored to be on the verge of resorting to the bankruptcy courts to keep itself alive toward the end of the month, spooking investors out of the sector with scant regard to the companies being sold. So What: Westmoreland Coal is, indeed, a coal miner, but it has something of a differentiated business model. First, unlike most of the companies resorting to bankruptcy right now, it has no exposure to metallurgical coal. Second, it's focused on operating coal mines in close proximity to its customers (often, quite literally, right next door). Third, it has long-term contracts in place with an average length of 10 years (most miners have contracts that last only a year or two). Fourth, the company recently took control of a limited partnership through which it can raise growth capital while still controlling its mines -- potentially allowing it to use the downturn to grow its business. True, thermal coal is in the doldrums as natural gas gains electric generation market share and environmental concerns tarnish coal's image. 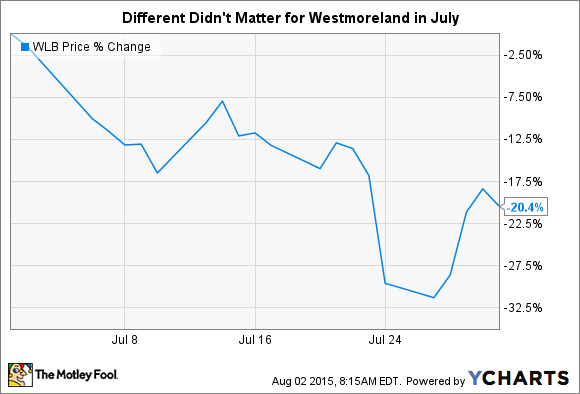 But Westmoreland Coal reaffirmed its 2015 guidance when it reported second-quarter earnings. And it looks like it has a solid sales pipeline for as much as 10 years out. In other words, everything looks like it's still on track at this miner no matter what's going on with its peers. Now What: Coal isn't a sector for investors with weak stomachs. But if you are willing to step into the fray, Westmoreland Coal should be on your short list of stocks to consider. It simply isn't your typical miner, which could make all the difference in today's increasingly difficult-to-navigate coal market.